Certainly Private companies, French or foreigners, producers and exporters of security and defence means, can only be interested in such information. The field is huge and immense, from dress and clothes equipment up to the heavy armament and the various vehicles (armoured ground vehicles, helicopter, high speed boats, etc. ), including all computing, electronic and video surveillance equipment production. 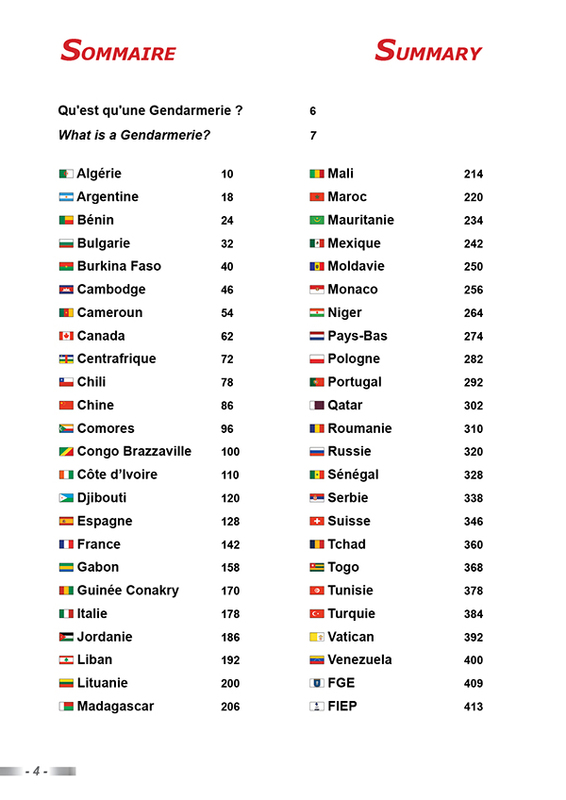 It is to answer to a more and more pressing that the French Gendarmerie History and Heritage National Society decided to register in its 2015 Present time History program 2015 the publication of a work gathering, under the shape of a directory, a maximum of information, for the use of multiple addressees, on the Gendarmeries of the World. It has taken one year of persevering work to a 5 French Gendarmerie officers and non-commissioned officers’ team from active, reserve or retired positions, volunteers or under contract, to carry out, under the SNHPG president’s supervision, this document, which required multiple skills. It was indeed a question, first of all, of collecting a maximum of reliable and verifiable information from very diverse sources. To validate that information with competent official bodies and to structure them according to a unique standard constituted the second phase. The translation, which followed was essential in order to ensure a world distribution. Finally the layout required an original and high-quality computer graphics. Result. A 416 pages work in A4 format including, in files from 6 to 14 pages, all the information concerning gendarmeries or same type forces from 45 countries of the world. This document is bilingual, in French and in English (in page facing each other, even pages in French, and odd in English). It is illustrated with 360 photos. For those who want to see first before commanding, they can visualize the files of 5 gendarmeries presented in example or consult the list of countries. - the Senegalese National Gendarmerie.